The unlikely partnership between Airbus and the Microsoft Hololens has led to the development of the world’s first mixed reality trainer for aviation applications. 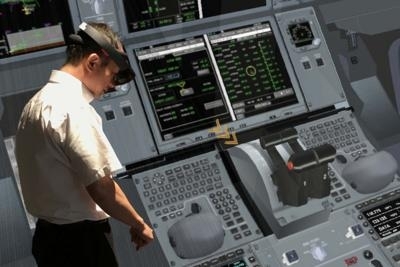 In cooperation with Japan Airlines(JAL), Airbus has developed a prototype for training the mechanics and crew of A35 XWB using the ‘Hololens’ technology and immersive headsets. A considerable amount of resources is focused on training the crew to develop skills required for the operation of the aircraft. This new technology will provide a cost-effective and safer alternative to the traditional training methods. The headsets enable the user to train on an interactive, virtual 3D system while being aware of their surroundings and coworkers. Trainees can access the aircraft digital data which can be viewed from any angle to virtually run specific aircraft procedures. President of JAL Engineering, Yuji Akasaka believes that the success of this technology will set new standards regarding training in the aviation industry. Airbus Japan claims the usage of this technology will revolutionize the way people in the industry interact with aircraft data and work process. It is expected that the debut of this technology will be in 2019 with the delivery of the first A35 XWB aircraft to JAL. Airbus plans to offer “Hololens” for some selected training scenarios to other airlines in the world including JAL.